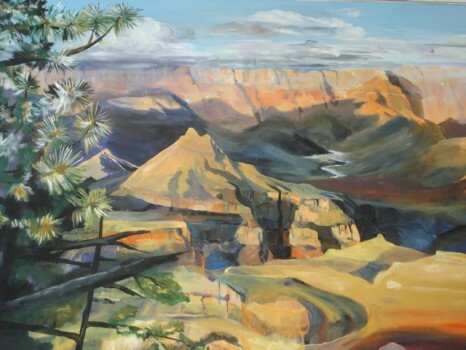 Julie was selected by the Grand Canyon Association to be their first South Rim Artist in Residence, a program that had been going on for several years on the North rim and other National Parks, but only recently started on the South. 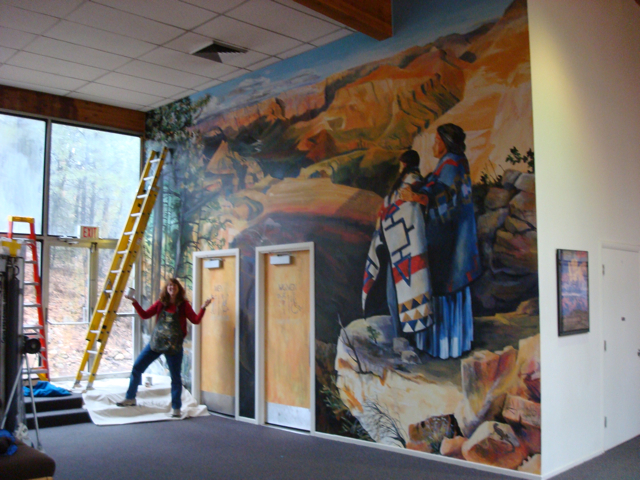 She selected as the sight of her mural the Shrine of the Ages, the place where the Grand Canyon Symphony performs, where educational programs are held and where churches hold meetings, plus many other functions. It’s a beautiful stone building with magnificent woodwork in the front entrance….the perfect place to paint a mural that will last the ages. The theme of the mural is centered around the idea that the mysteries of life can be taught by using nature as a teaching tool. 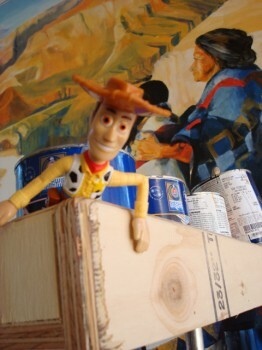 They are taught using stories, song, dance, paint and example. Truth is truth, throughout the ages. This idea is represented by the old Grandmother, dressed in ancient clothing, teaching the young one, dressed in a combination of the ancient clothing (representing all acquired human knowledge) and the modern day blue jeans. In the mural are several “stories” taught via nature, some being the Tree of Life motif, the Hopi entrance into the 4th world, a depiction of Lehi’s Dream, the symbolism of the water, and several others. Julie only had 3 weeks from the time she learned she would paint this mural till the time she actually started. 2 Trips up to the canyon and many photographs and studies later, she was ready. Her next-door neighbor Gloria, who states her race as being “just about everything!” served well as the model for the Grandmother. “Before” photo, and the first charcoal sketches on the wall. 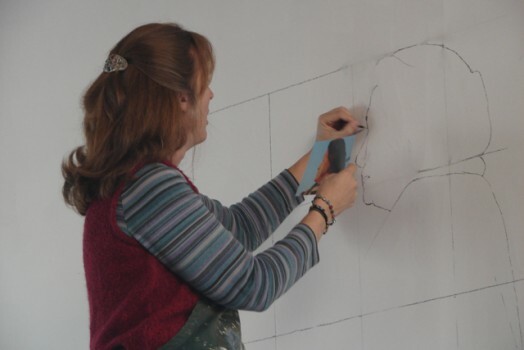 One of the cool things Julie got to do was conduct 3 workshops, and teach muraling classes at the local school. Chalk murals were the perfect thing! We also did chalk murals on the rim of the canyon in front of the Bright Angel Lodge on Thanksgiving Day for the tourists. Good fun! Some days, painting comes easy, some days not. The day before doing this valley was one of those “off” days. Julie came in the next morning trying to figure what she’d work on that day. Do the women? The trees? Arrgh! What!? The thought kept coming to her “do the valley”. But she didn’t WANT to do the valley. It was too important and if she was having an off day again, it would be bad. “Do the valley!”. So okay she listened, and loved the results and truly enjoyed painting that part! 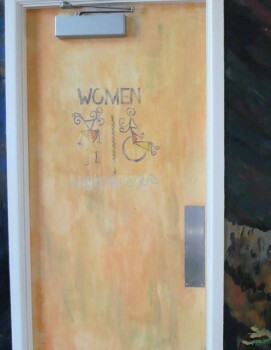 One of the challenges Julie faced was how to handle the doors to the restrooms that were on the wall, still letting people know what they were, but blending with the mural. She figured folks have pretty much always ducked behind a rock, so she made one for them. 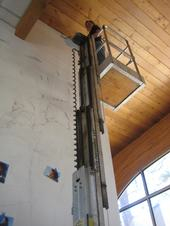 This is my trusty assistant Kate doing scary cherry picker duty!!! 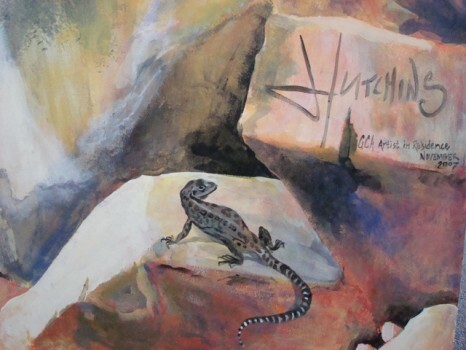 And this is Julie’s “famous” birdy lizard and signature! Someday, as asked by the Grand Canyon Association and the Interpretive Rangers at the canyon, Julie will return and do another residency to paint the California Condors in flight. Hopefully not too far off into the future!